The ASTM G48 Standard Methods A and B are routinely implemented as mandatory quality control requirements and as rapid tools to qualitatively compare the localized corrosion resistance of stainless steels and nickel alloys (and corrosion resistant alloys in general). For all of you unfamiliar with the standard, ASTM G48 uses a 6% ferric chloride (FeCl3) solution with a pH between 0.40 and 1.30 depending on the method chosen. Some researchers justify the use of these environments to estimate service temperature limits based on the analysis of critical pitting and crevice temperatures (CPT and CCT, respectively). Steinsmno et al. and Rogne at al. 1, 2, for example, argue that the test is representative of service conditions given that the open-circuit potential (EOC) of stainless steels in the acidic ferric chloride solution is similar to reported values in (chlorinated) seawater. The authors go further and claim that the chloride concentration of these two solutions "is not significantly different" (i.e. 0.6 M Cl- in standard seawater versus 1.10 M Cl- in a FeCl3 test, or a 1.85 times difference). This interpretation of CPT and CCT temperatures resulted in the implementation of temperature limitations in most industry and company specific standards (e.g. NORSOK M–630). A quick review of oil and gas proprietary specifications reveals that, for instance, the maximum allowable seawater temperature for duplex stainless steels is between 20 and 30 ℃ based on localized corrosion concerns for weldments and crevices. The problem with this interpretation of the ASTM G48 results is that the acidic FeCl3 environment is not representative of the actual service environment. 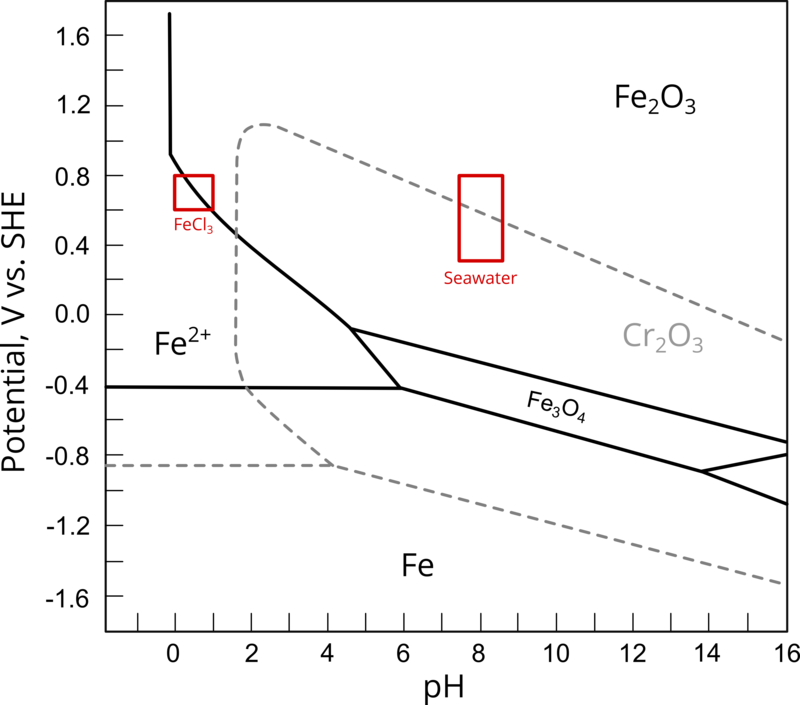 Figure 1 shows the reported potential-pH regions for 6% FeCl3 and 6% FeCl3 + HCl solutions and seawater (natural and chlorinated) superimposed on the Fe and Cr Pourbaix diagrams at 25 ℃. As shown in Figure 1, at the same oxidizing power, iron and chromium oxides become thermodynamically unstable at the extremely low pH values of the ASTM G48 environment. Assuming that all other variables are equal, this thermodynamic instability will undoubtedly result in lower pitting and crevice potentials (EP and ECerv, respectively) and temperatures by facilitating the nucleation of stable pits, when compared to tests conducted at more alkaline pH values. Galvele has demonstrated the influence of bulk pH and chloride concentration in his classic work on pitting corrosion modeling 3. Likewise, given that pitting potentials of carbon and stainless steels typically follow an inverse logarithmic relationship with chloride concentration 4, 5, the higher chloride content of the FeCl3 solution is expected to lower Ep and Ecerv even further. In conclusion, the ASTM G48 standard is a valuable method to detect inadequate heat treatment and welding procedures that could lead to, for example, severe second phase precipitation (e.g. sigma phase in duplex and super duplex stainless steels). These methods can also be used to screen several candidate alloys. However, critical pitting and crevice temperatures determined in FeCl3 cannot be correlated with maximum allowable service temperatures. Doing so may lead to a gross underestimation of the actual CPT and CCT values. Underestimating CPT and CCT will result, in turn, in a conservative materials selection criterion, increasing materials and manufacturing costs unnecessarily. Electrochemical tests, such as the ASTM G61 cyclic potentiodynamic polarization test method, in the actual service electrolyte, should be used to measure pitting and crevice potentials as a function of temperature. EP and ECrev are a better representation of the localized corrosion resistance.